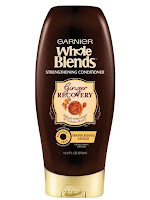 Whole Blends from Garnier has taken the mass market hair care world by storm. Their entire line features ingredients that are targeted towards your hairs needs and will help to strengthen, define and help with frizz, flyaways, etc. Their newest line, Ginger Recovery, is paraben free and brings the essence of antioxidant rich ginger extract which helps to recover strength together with golden honey, which is known to fortify hair. It provides twice the anti-breakage protection, making fragile hair stronger instantly. The Ginger Recovery products include a shampoo, conditioner and a Leave-In or Rinse-Out Treatment (to be reviewed later) that are all blended with purpose tailor made formulas known to strengthen, rejuvenate and revitalize fragile hair. For best results, massage shampoo into wet hair, lather and rinse thoroughly then follow with their strengthening conditioner and treatment. After using this shampoo and conditioner and then using the shampoo and conditioner I can sufficiently say that these products do appear to helps strengthen the hair shaft. I used these products for a few weeks and felt my hair to be stronger and did not break as easily as it usually did. Which is definitely a good thing. I would also like to say that this shampoo and conditioner is easy to use, smells divine and leaves hair feeling bouncy, manageable, shiny and without frizziness in it, which is something I am always on the lookout for. 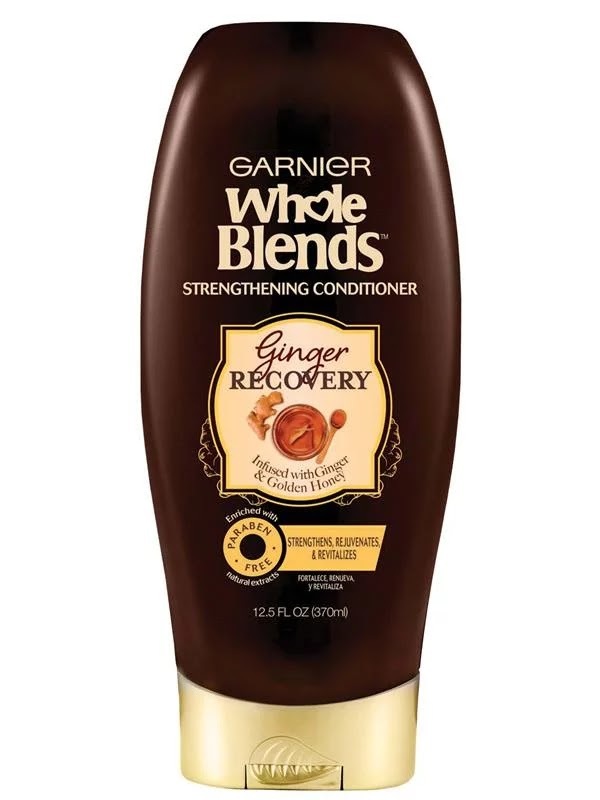 Whole Blends Ginger Recovery comes in a 12.5 fl.oz./370mL bottle and is it is available online from www.ulta.com, www.walgreens.com, www.walmart.com, www.riteaid.com, www.cvs.com,www.drugstore.com and www.target.com. It is also available in mass market retailers such as Ulta, Walgreens, Target, CVS, Rite-Aid, and Wal-Mart. 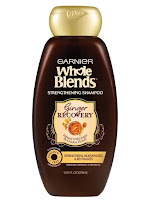 Like Garnier on Facebook: http://facebook.com/garnierusa; Follow Garnier on Twitter: @garnierusa; Follow Garnier on Pinterest: https://www.pinterest.com/garnierusa; Follow Garnier on instagram: https://www.instagram.com/garnierusa; Follow Garnier on YouTube:https://www.youtube.com/user/GarnierUSA; Follow Garnier on Google+: https://plus.google.com/s/garnierus/top.